This year the Brigade of Gurkhas commemorates 200 years of outstanding service and loyalty. Gurkhas have served in every major conflict and have conducted themselves with unparalleled distinction alongside their British counterparts. Today, Gurkhas are renowned for their graciousness, loyalty and courage. As reserved and mild-mannered in daily life as they are fearless and tenacious in battle, they are dignified people and excellent soldiers. If I were to describe myself with full frankness — which is never advisable — it wouldn't sound half as commendable. 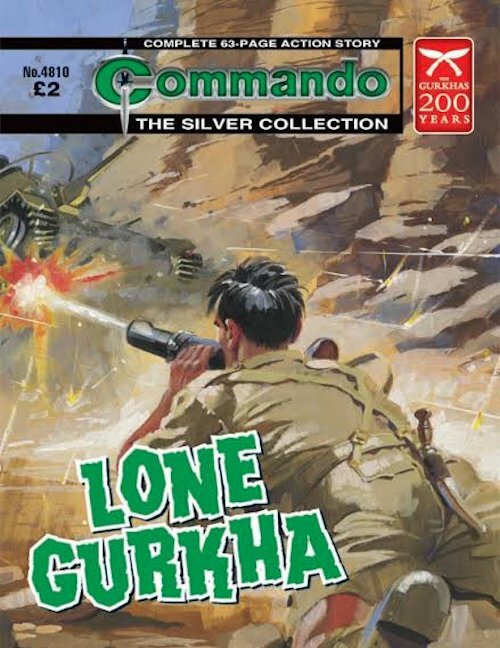 Commando is marking the anniversary with a re-release of Lone Gurkha (top) and Gurkhas to the Rescue. Lone Gurkha is top-drawer classic entertainment; read agog as a lone Gurkha prepares to hold off a heavy Japanese assault, kukri at the ready. The Queen's Truncheon? I thought that might drag you in. The Queen's Truncheon is the ceremonial staff — and Colour — carried by the Royal Gurkha Rifles. Commando has also announced that it is collaborating with Osprey Publishing — the leading publisher of illustrated military history — to create a series of new graphic war novels that will also contain 'detailed historical information describing the featured conflict, campaign and combatants'. More intel on this development as we receive it.